For more than 10 years Ingrid Roche has lived at her Maple Avenue home, but after Tuesday night, she now wants to move out. "I'm just glad that I didn't lose my child," said Roche. 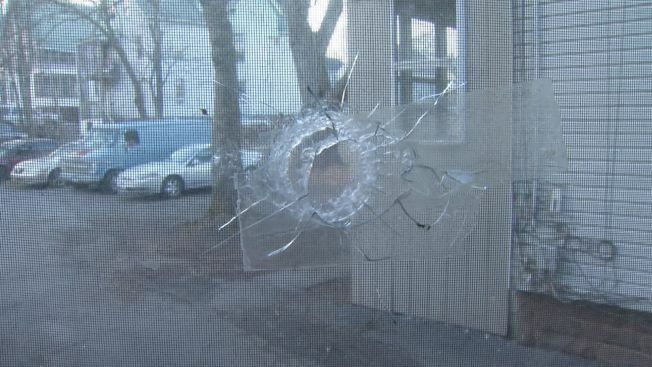 Roche says a bullet pierced her home around 7:30 Tuesday night. At the time, she was at work and her daughter, who was home alone, tried to call, but Roche's phone had died. When Roche got home at eight, she called police and says they arrived several hours later. In the living room you can see a hole in the blinds and behind it the shattered glass. At another window, there's a ripped curtain and the glass broken there too. She says police told her it appears the bullet entered the home through one window and exited through the other. Her daughter sat just a couple feet away, sitting at a computer desk. “It could have been a different angle. She could have been sitting here where I'm standing. She could have been walking by, and bullets don't have any names,” said Roche. What's more, Roche lives directly across the street from M.D. Fox School, which her son attends. "It terrifies me because you know what, it could have been earlier when all the students had been coming out, and it would have been devastating," said Roche. This is the second such incident in Hartford in two weeks. Last week on Capitol Avenue three children and their mom ran for cover after bullets flew through their home. No one was injured, but the family there said they wanted to move out. Roche says she feels the same way. "I don't feel safe anymore in my own home," said Roche. NBC Connecticut reached out to Hartford Public Schools as well as Hartford Police, and they were unable to provide any additional information at this time.